GoldChops is small business that provides a quality gold plating service exclusively for brass & woodwind players. I specialize in gold plating brass mouthpieces, flute lip plates & crowns, and gold trim work on silver plated instruments. I am a veteran trumpet player, and I know the importance of not being without your primary mouthpiece for any length of time. YOU WANT YOUR MOUTHPIECE SERVICED FAST and that is my priority at GoldChops. I use only USPS Priority Mail 2-3 Day service, and in non-repair work, I offer 24 hour gold plating service to GET YOUR MOUTHPIECE BACK TO YOU WITHIN THE WEEK. • Back within the week? How is that possible? This fast response time partially relies on you. You need to send me an advance Email to insure I am prepared, then ship the item with payment via USPS Priority Mail 2-3 day service (usually around $7). If it's a non-repair or very minor repair item, I can plate in 24 hrs and send back using the same USPS service. • Is the Gold plating used Cyanide free? Absolutely. I use only high quality gold electroplate purchased in the United States by a national firm. 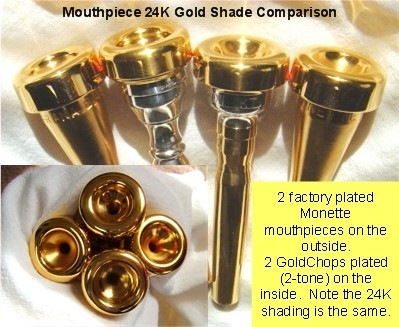 • Does goldplating my favorite mouthpiece change the characteristics in any way? The dimensions remain the same as the plating is only 2/10,000s of an inch thick. Plating the rim and cup in gold adds flexibility to the embouchure, as it gives a "slicker" feeling, allowing the lips to move more freely. Gold is also faster to warm up compared to silver plating. However, some players prefer not to have that free movement and like the "locked in" feeling. If that is the case, I do offer gold plating of the shank and exterior for appearance purposes, leaving the rim and cup silver plated. I offer a 90 day 100% and 6 month 50% warranty at no charge!!! As with any type of plating, be it gold, silver,nickel, chrome, etc., the plating will not last forever, but if properly cared for, it can last for several years. Too many factors exist to determine when the plating finally fades. • How do I care for the gold plating? Simply use a 100% soft cotton cloth and a couple drops of valve oil to lightly rub off any marks on it. A very mild dish soap also works well. Unlike silver, which tarnishes easily, gold usually does not require polishing. NEVER use any harsh abrasives on the gold plating, not even silver polish. • Will the new gold plating cover up any scratches and dings? No. In fact, it may even enhance the imperfections. Plating a badly worn mouthpiece, without repair, will only produce a gold plated, badly worn mouthpiece. I can chemically clean, remove tarnish, and buff minor imperfections out, but I cannot fill holes in the raw brass. A NEW or Excellent condition mouthpiece produces the best results. • Can you plate over Raw Brass? Yes, however, it does not maintain its' finish as long as the plating over silver. I would recommend you have the silver plate added by Anderson Plating or some other company prior to having it trimmed in gold. • Do you gold trim instrument parts? Yes, but all parts must be in good condition silver plate prior to performing the work. All parts must have the felts or rubber removed. True "Mother of Pearl" or Abalone fingertips cannot be dipped in gold solution as damage my occur. For an estimate, send me a description and number of parts via EMail. Flute and Piccolo crowns and embouchure plates are common items to have plated in gold. • What is the shipping charge? Shipping is always just one low price of $7.00 for Priority Mail Shipping via USPS. This one low charge is for any number of items. 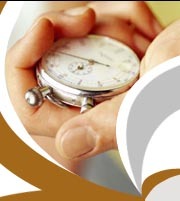 Insurance is OPTIONAL at an additional $5 fee and may delay the shipping by an additional day. GoldChops is not responsible for any lost or damaged items which may occur during shipping.